Before I explain how I play golf with vision loss, it is important to have an understanding of the setting in which golf is played. Golf is played in a beautiful park-like atmosphere: luscious green lawns, rows of trees, water ranging from rivers to oceans to lakes and ponds, on land ranging from Midwest prairies to rolling hills, mountains or swamps. The ideal day will include sunshine, light breezes and temperatures in the 70’s or 80’s, with the smell of fresh cut grass and flowers in the air. The golf course may include wildlife: birds of all kinds, elk, deer, alligators and water moccasins. Each course is unique just like a fingerprint, no two are the same! Wow, who wouldn’t want to spend a few hours on the golf course? Now that you have a feel for the setting, let me explain the game. Each player carries a mix of irons, woods, a pitching wedge and a putter. Collectively, this is known as a “set of golf clubs.” The set of clubs are stored in a golf bag along with the other equipment golfers deem necessary to play their best. In the bag you will also find a golf glove, tees, and hard round projectiles known as golf balls. A player may carry as many golf balls as they feel necessary to complete the round. The object of the game is to strike the projectile with a club until the golf ball lands in a small hole between 100 to 550 yards away in as few shots as possible. This process is repeated 18 times to complete a “round” of golf. The world’s greatest golfers take between 65 and 75 shots to accomplish this feat. The average golfer shoots around 100. As my vision has faded, I continued to golf with increasing help from fellow golfers and still enjoy the game, the setting and the social aspect. My vision is now basic light perception that still allows me to see a fuzzy spot when the ball is at my feet. My family, friends or fellow golfers assist me by watching my ball when I hit it, driving the cart, guiding me to the ball, lining me up for the shot and informing me of the outcome of my swing, which is usually not very good. As my age has gotten higher, so has my score, but the enjoyment I receive has also increased. Since you only compete against your own score, the only pressure is what you put on yourself. For me, each hole is a new challenge and I get 18 tries to get it right. Most days I don’t even keep score. The pleasure comes from being in the great outdoors, conversing with the members of your foursome, laughing at yourself and joking with the other players. Golf is my way of escaping from the pressures of the real world for a few hours. My family and friends make me feel part of the golfing community. We are all trying to make our next shot better than the last. We have a great time helping each other finish the round and get to the all-important 19th hole, the clubhouse, where there are cold drinks, good food, great stories and many laughs. I hope this explanation has given you a picture of a sport you may want to try or continue playing with vision loss. I am a member of the Calumet City Illinois Lions Club and am organizing a golf outing this fall where players with vision loss are paired up with sighted golfers. We’ll play a round using the scramble* format. Each foursome will include one visually impaired golfer. The goal of the outing is to encourage teamwork between the sighted and visually impaired golfers and open lines of communication in a relaxed setting. If this sounds like something you would like to participate in, please contact me at 708-895-2339. * In a scramble” format, each golfer takes a shot. The foursome uses the best shot and all other players pick up their golf balls and proceed to the location of the best shot. The procedure is repeated until the golf ball is putted into the hole. Chuck Eggebrecht is a family man with many interests. He enjoys the simple pleasures in life: golfing, gardening and listening to newspapers, magazines and books. Chuck is a member of the Calumet City Lions Club and especially enjoys helping people in need. His favorite song is the theme from Rocky because he believes nothing is impossible. Fantastic article! Your perserverence and encouragement are inspiring! 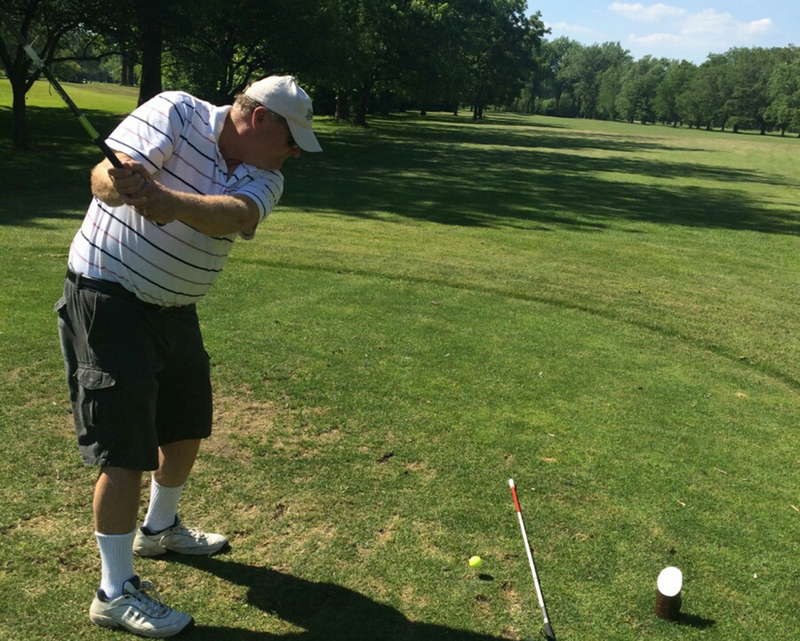 Best of luck to you and all the golfers – both sighted & visually impaired, at the outing! Great post Chuck! My grandpa suffers from several vision problems but is still going strong on the course to this day. P.S. I’m from Illinois too (Joliet). I agree that the pleasure of playing golf is being in the outdoors with friends. I think that a lot of amateur golfers are too hard on themselves to do better. I’ll have to explain this to those I go golfing with. Perhaps they’ll even golf better. Very inspiring article chuck! I of course sympathise with your struggle, but it’s commendable that you can take a positive look on it and use golf to keep enjoying your life.